This article appeared in the August 2011 issue of Miranda News. It may not be reproduced without permission. “Particular species of birds, like different nations of men, have their congenial climes and favourite countries; but wanderers are common to both; some in search of better fare, some of adventures, others led by curiosity, and many driven by storms or accidents.” Alexander Wilson American Ornithology, 1826. One day in September 1983 there was a minor commotion on the waterfront at Port Vila, Vanuatu. A bird was attracting much attention from local people as it flew around the harbour edge. Some said they had never before seen such a bird – a striking black and white affair with a vivid orange bill. Alerted by a familiar call, visiting New Zealand biologist Rod Hay watched it land briefly opposite the Post Office before flying to an island near the harbour. For Hay, fresh from field work on the Rakaia River for his PhD on Wrybill, it was a most familiar bird: clearly an oystercatcher, and almost certainly a New Zealand one. That it could have been an Australian Pied Oystercatcher was considered unlikely as the bird had more white on its back than is found in that species. Furthermore, unlike the South Island Pied Oystercatcher (SIPO), the Australian birds are quite sedentary. However Vanuatu was over 2000 km outside a SIPO’s normal South Island – North Island loop, so what was this bird doing so far from home, especially considering there were no records of SIPO from the Kermadecs or New Caledonia? There was, however, a bird ‘indistinguishable from SIPO’ that had been seen on Lord Howe Island the previous year. The fact that both records occurred at a time of year when SIPO are migrating south led to the hypothesis that ‘reverse migration’ may have been the cause of the fault. According to the theory, a ‘mirror image’ navigational error occurs when a migrant bird takes a correct bearing from a north-south axis but travels on the wrong side of that axis, that is, ‘a confusion of left and right orientation’ occurs. However, this hypothesis is still subject to much debate among scientists. But whatever the particular mechanism or navigational fault responsible, the oystercatcher was clearly a long way from home. It is in the nature of migratory shorebirds, covering the vast distances that some of them do, to sometimes get it wrong. To the excitement of the birder, but possible doom of the bird itself, a vagrant individual can turn up in all sorts of places – sometimes an entire ocean away from where it should be. In 1921 Canterbury ornithologist, hunter and collector, Edgar Stead pondered the possibilities of this. “Most of the plovers are gregarious in the winter, and so, no doubt, odd specimens, and even small flocks, of a species which does not normally migrate to New Zealand would get entrained by a flock that did so and come along with it. In this way it seems to me practically all the Asiatic migratory species of plover will sooner or later visit New Zealand, though many of them at the present time have not been recorded any farther than Australia.” Stead was clearly correct in this view: since 1921 at least 19 species of Northern Hemisphere migrants have been added to the official New Zealand list. In 2005 the Ruff at Miranda did not stay for long. The Welshman appeared back at the front desk. For the last couple of hours he had been down the road looking at birds on the shellbanks and the Stilt Pools. “How did you get on?” I asked. “Pretty good”, he replied. “On the pools there were loads of Pied Stilts, Bar-tailed Godwit, Red Knot, a Ruff, a Sharp-tailed Sandpiper, a few Wrybills and -”. This required further inquiry. The Shorebird Centre operates a bird sightings book, where people are encouraged to record what birds they have seen and, where relevant, in what numbers. Anything unusual would be forwarded to the Rare Birds Committee of OSNZ for evaluation, a process that, by necessity, needs to be rigorous and thorough. For as a species we are all too fallible. We see things that are not there, and miss things that are there. Besides, it is often difficult to record accurate information about a bird you may have seen fleetingly. In short, credible evidence is required. I began the tactful process of establishing the Welshman’s credentials. How experienced a birder was he? Was he familiar with Ruff? His initial description of the bird – ‘that it was a male with a few remaining traces of breeding plumage ’ – certainly indicated a degree of knowledge. But just as my polite inquisition was getting underway, he whipped out a digital video camera and said ‘here, look at this.’ The footage showed a familiar landscape, unmistakably the Stilt Pools – where a rather oddly shaped wader perched on long reddish legs was foraging. Its head seemed smaller than one would expect of a bird of these proportions, its bill slightly drooping. The feathers on its back were very dark with broad pale edges. It was certainly a bird I had never seen before. Several minutes later, a ‘Closed’ sign was on the door and the two of us were standing by the pools looking at the first Ruff to be recorded on the Firth of Thames. The breeding range for Ruff extends across northern Europe and Russia, with the bulk of the population wintering in Africa and parts of south Asia. However it is also a rare but regular visitor to Australia, in which case, like the Port Vila oystercatcher, this Ruff may actually have only been a few thousand kilometres adrift. But wherever the wintering site was that it had been aiming for, it clearly had gone astray somewhere. It was just the eleventh record of the species in New Zealand. 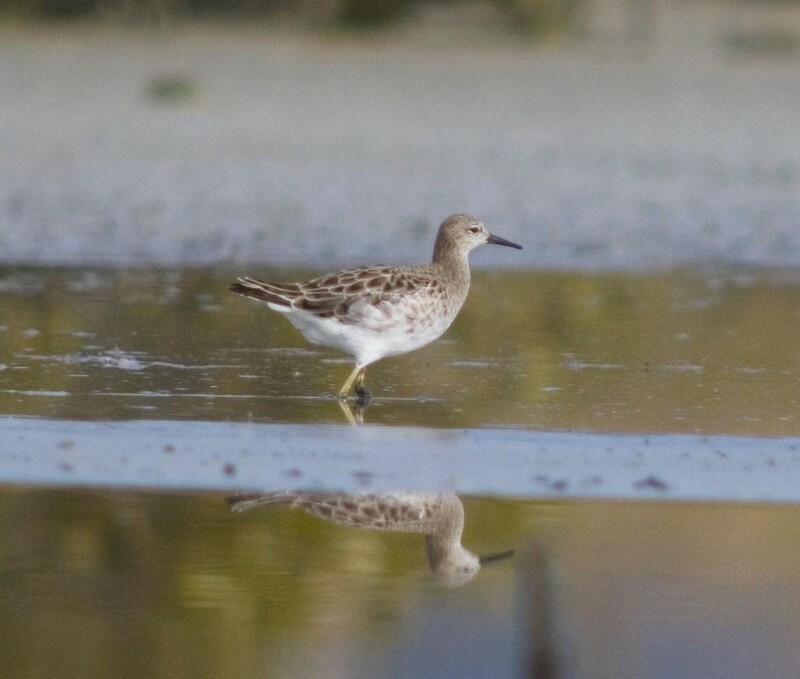 The New Zealand Checklist lists 46 species of Northern Hemisphere breeding shorebirds recorded in New Zealand. Some of these are of course annual visitors – be it perhaps 90,000 Bar-tailed Godwits or a few dozen Sharp-tailed Sandpipers. At least 11 species, such as Marsh Sandpiper and Common Greenshank, are listed as uncommon but possibly annual visitors, while 20 are recorded as genuine vagrants for which only a handful of records exist or, in the case of Stilt Sandpiper, just the one. So how much do we know about these birds? How did they get it wrong? Furthermore, once they are in the wrong place, can they subsequently get back to normal? A bird arriving in New Zealand could have overshot – merely missed its correct destination, possibly with weather factors involved. 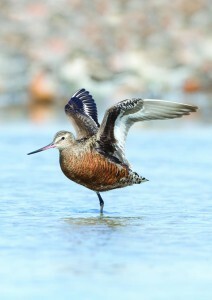 Perhaps Bar-tailed Godwits seen on the Auckland Islands were originally planning to stop in Southland. Another possibility is the vagrant may be an inexperienced juvenile. There is considerable evidence that on their first journey after fledging, juveniles are more likely than adults to go astray, and there does seem to be a preponderance of young birds among known vagrants. The inexperience of some young birds is further compounded by the circumstances under which they are making their first migrations without, in the case of some species, the company of experienced adults. Or Alexander Wilson may have been right and perhaps some birds may just like to wander –whether through curiosity and pursuit of adventure, or not. Sometimes it may involve merely the length of the South Island: from time to time southern New Zealand Dotterels from Stewart Island turn up on Farewell Spit, and most often they turn out to be juveniles. But once a bird becomes a vagrant, can it subsequently return to the places it should be? In other words, can a young bird make a correction, learn from its mistakes, and then perform better later in its life? The answer at present is unclear. 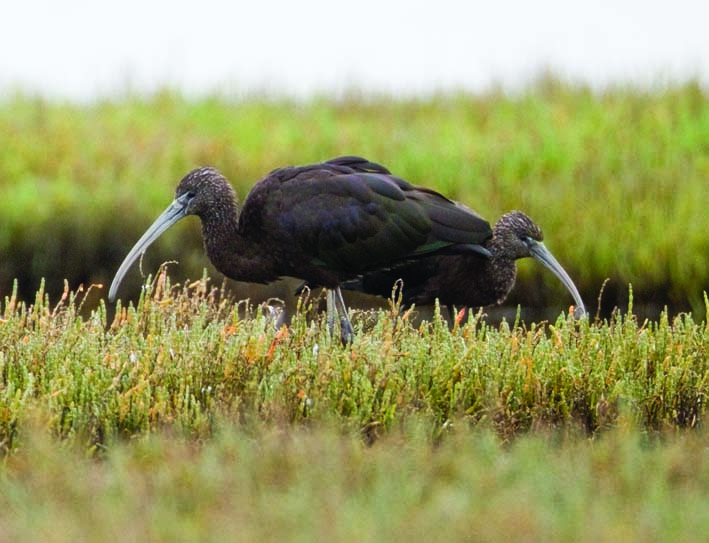 It does seem likely that a bird that ends up thousands of kilometres away from where it should be, perhaps involving considerable longitudinal displacement, may find it challenging to get back to normal. Take for example Hudsonian Godwits, one or two of which regularly seem to turn up in New Zealand. Their breeding range extends in pockets from western Alaska across Canada to Hudson Bay, from where they migrate to southern South America. Most years in New Zealand there are one or two Hudsonians reported, and the most likely way they got here is in a flock of Bar-tailed Godwits making their normal southward migration. However bar-taileds return to the breeding ground via the coast of East Asia, where there are few if any records of Hudsonians. For a vagrant to return north in the same way it arrived, it would presumably need to accompany bar-taileds on a route completely foreign to its genes. The southward journey could be seen as an aberration, the bird got it wrong and was unable to make a correction and so arrived in New Zealand. But accompanying bar-taileds north again would entail even further longitudinal displacement to the Yellow Sea region, before heading back to Alaska. Which leads to yet another question: is vagrancy a likely avenue for range expansion, the establishment of new populations of a species, or new migration routes? That migrants turn up in unusual places more often than non-migrants is not surprising, nor the fact that most records of vagrancy coincide with normal migration seasons. However we must remember migratory birds are programmed in certain ways. If a migrant turns up where it should not be, perhaps as a result of weather, it may still be in a migratory state and so ready to reorient itself and continue with its journey. Many vagrants do in fact appear to move on fairly quickly. Yet it also seems likely that many current bird populations, particularly those on oceanic islands, are descended from ancestral vagrants. Consider for instance, the number of European species introduced to the New Zealand mainland in the nineteenth century that have since established populations on various sub-Antarctic islands. Then again, establishment of a new population relies on at least one viable pair arriving at a new site and surviving long enough to successfully breed. Given some of the far-flung places vagrants may turn up, the odds of that must be erratic at best. A further unknown involves the economics of a migratory flight. 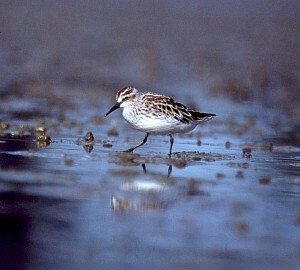 Most known migration events, particularly of shorebirds, involve flocks rather than individuals. We know that flying within a formation can significantly reduce flight costs, so presumably an optimal migration strategy is to set out with company. 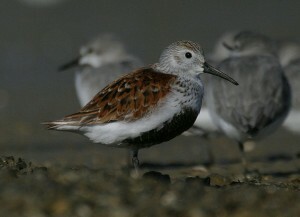 So if a Broad-billed Sandpiper is seen in New Zealand, did it arrive with others of its kind? This seems unlikely given there has seldom been more than one bird seen at a time. So did it arrive in a flock of another species, perhaps with birds of a similar size? This seems a strong possibility. But if so, what happens when the time comes to depart northward again? If the Broad-billed Sandpiper opts not to remain here, responding instead to the hormonal tug of its genes, does it wait for a departing flock of suitable strangers, or does it leave by itself, somehow coping with the predicted extra flight costs? No one knows for sure. It may even turn out that the predicted benefits of flying in a flock are not as important for some birds. After all one thing learned from the satellite tracking of godwits, was the consistent tendency we have to underestimate what some of these birds are capable of.